Have you guys seen the Lazy Environmentalist? I discovered Season 1 of his TV show on Netflix (you can check it out here) and am in love. My mantra when talking about the green parenting choices we make has traditionally been "I am Not a Hippie." Because really? I'm not. Promise. I'm way too lazy and too mainstream to qualify as a hippie. BUT I do think taking care of the earth and our families in the least toxic, least wasteful way possible is important. I'm more like "The Lazy Green Mom." 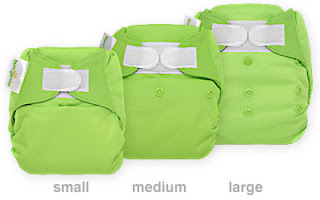 Which is why we use reusable (AKA "cloth") diapers: a solution that is both lazy and green. Love it! Kaypha rocking a Bum Genius 4.0 Diaper. Of all of the choices I made while preparing for the arrival of our little one, our choice to use reusable or cloth diapers has by far been the decision which has caused the most raised eyebrows and statements of disbelief in our ability to continue using them. Big flat pieces of cotton, sharp diaper pins, lots of leaks, gross laundry and a stinky nursery. Green but definitely not Lazy. Thankfully, our cloth diapering experience hasn't included any of those! They look kind of like disposables, right? No big sheets of cloth. No pins. Open diaper, insert baby, close up with velcro (or snaps if you prefer). Done. These are so far removed from stacks of thin cotton and pins that I almost don't like calling them "cloth" diapers and would rather call them "reusable" diapers or "washable" diapers. They are super daddy and babysitter friendly and really only have one extra step beyond disposables, which is inserting the stuffing. Why reuse diapers when it's so convenient to throw them away? My initial motivation behind exploring the world of cloth diapers was environmental. Even if you have super baby who is able to be potty trained by their second birthday, you're conservatively looking at using approximately 3,000 diapers the first year and 2,200 diapers the second year they are alive. That's more than 5,000 diapers in just the first 2 years! Estimates I found online, though, say that most babies actually use between 6,000 - 10,000 diapers by the time they are completely toilet trained. Think about that in terms of space. As far as raw materials go, disposable diapers add up to approximately 2 tons of waste per baby over the course of their diapering season. And that's just waste space. In order to even create the diapers, “Diapers: Environmental Impacts and Lifecycle Analysis" estimates that more than 300 pounds of wood, 50 pounds of patroleum feedstocks and 20 pounds of chlorine are used per baby per year for their disposable diapers. Even for not-a-hippie me (and my even less of a hippie husband), this just seems to add up to a whole lot of waste. And as someone who takes the humanitarian responsibility of Earth stewardship really seriously, I just couldn't do it. What really convinced my husband, though, was the cost savings. Even if you use off-brand diapers, you are looking at a cost of about $0.15 - $0.24 per diaper depending on diaper size. Name brand diapers like Pampers and Huggies cost anywhere from $0.20 - $0.47 per diaper. Based on really conservative estimates, then, American parents are facing a price tag of about $1,300 for off brand diapers or $2,500 for name brand diapers in the first two years alone. If potty training takes longer (as it often does in disposables), the price goes up even more. This doesn't include the price of disposable wipes, a diaper genie and diaper genie refills. Plus the potential rise in cost of your garbage bill if the area you live in bases the cost of your garbage bill on the volume of garbage your family produces. Compare that to our arsenal of brand name reusable diapers, which I purchased for just under $400. And because the diapers we chose are an adjustable size, we can use the same diapers from birth through potty training and never have to buy more. If we use the diapers again for a second child, the savings is even greater. So that's our story about why we chose cloth. And really, I think cloth might be right for some of you, too. Even if your child is a little older and you've been using disposables, cloth might still make sense for you. Based on diaper cost alone, if you think you have seven months or more of diaper wearing left between any current babies and future babies you're planning, you will save money using cloth. On a final note, please ask questions! We were able to make an informed decision about using cloth diapers because I had friends I could ask about it. If you're curious or have any questions on the specifics of life with cloth diapers, please ask me personally or in the comments below. I love helping people in get started with and be successful with cloth diapers! This post was imported from my previous attempt at a separate, green parenting centric blog called I'm Not Really a Hippie. Not Really a Hippie was abandoned at the end of 2010 when I realized having two blogs was both silly and hard to do. I import old posts from that blog from time to time in order to keep all my blog content together in one place. This post was modified slightly in order to update it. Love this! What a clear explanation on the benefits of CDing!!! I never knew there are “modern” cloth diapers. I already love BumGenius even if I don’t have a kid yet. But when I will have one I will definitely use them. Thanks for this great review. Love the fluff! (Cute baby, too) Not sure why it makes you lazy though!? The research you put in, and the laundering make you not lazy in my opinion. "Lazy" I guess in that it's user friendly. Honestly, it takes less time and effort to wash diapers than to go to Target, buy diapers and then take the trash out. Wow! So your sister referred me to your blog after she saw my question about cloth diapering on The Nest. What a great review! I own gDiapers, but don't love them. My little guy was pooping too much throughout the day to keep up with the plastic inserts (which would get pretty messy) and I would run out out throughout the day. By nighttime, I was too exhausted to stay awake through all of the laundry cycles. How exactly does bumGenius work? Cloth diaper w/ velcro or snaps... and then what is on the inside? Can you walk me through a typical diaper change? How much laundry are you doing every night?